There was excitement in the air at school today. Not only was it Footy Day, it was also the day that the winner of the Yeo-Low Medal would be announced! 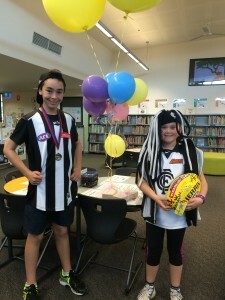 At the beginning of the term, 205 students signed up to complete the Reading Scavenger Hunt for an opportunity to win the Yeo-low Medal for Best and Fairest Reader which was an Indigenous Football generously given to us by author, Adrian Beck. This week, 57 students had completed the Reading Scavenger Hunt. They had demonstrated reading stamina and perseverance during the term by reading a variety of books, writing a book recommendation and having their photo taken in a favourite reading spot. Congratulations to each of you on your fabulous reading effort and you have your certificate to prove it! The students were reading to win the Yeo-low Medal (football) and a name would be randomly selected from a draw by Adrian. 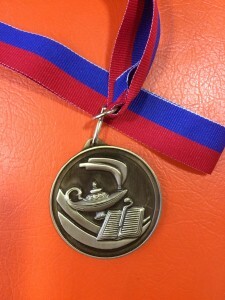 As the term progressed, I thought this might also be an opportunity to acknowledge a particular student’s reading effort with an actual medal. 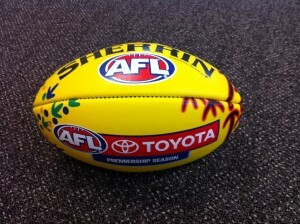 I hope the Yeo-low Medal might become an annual Best and Fairest Reader award. The students didn’t know about this until today. 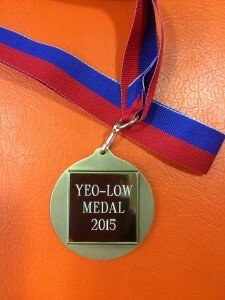 Here is our Yeo-low Medal. 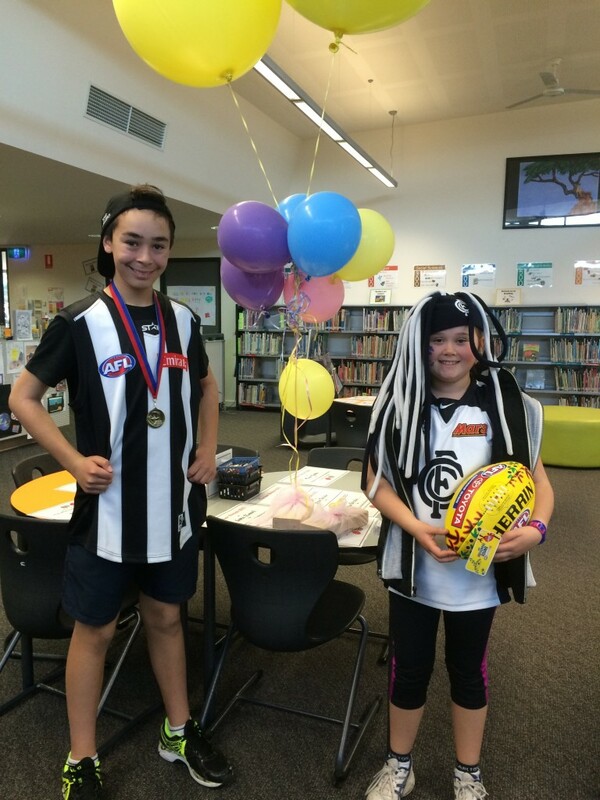 Congratulations to our two worthy winners of the 2015 Yeo-low Medal for Best and Fairest Reader! We have been incredibly fortunate to have Adrian Beck encouraging us to read and supporting us this term with his fun videos. It was lovely to see him receive a ‘rock star’ welcome when he arrived at school today. Adrian continued his spirit of fun when he wore his specially chosen suit for the presentation today. Thank you so much Adrian, we think of you as ‘our author’ these days! 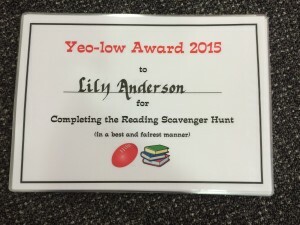 This entry was posted in Uncategorized and tagged Reading, Yeo-low Medal by smotlrcblog. Bookmark the permalink. Thanks for choosing me as a stand out and giving me a Yeo-Low medal. I feel very proud of myself and it was cool shaking Adrian Beck’s hand. 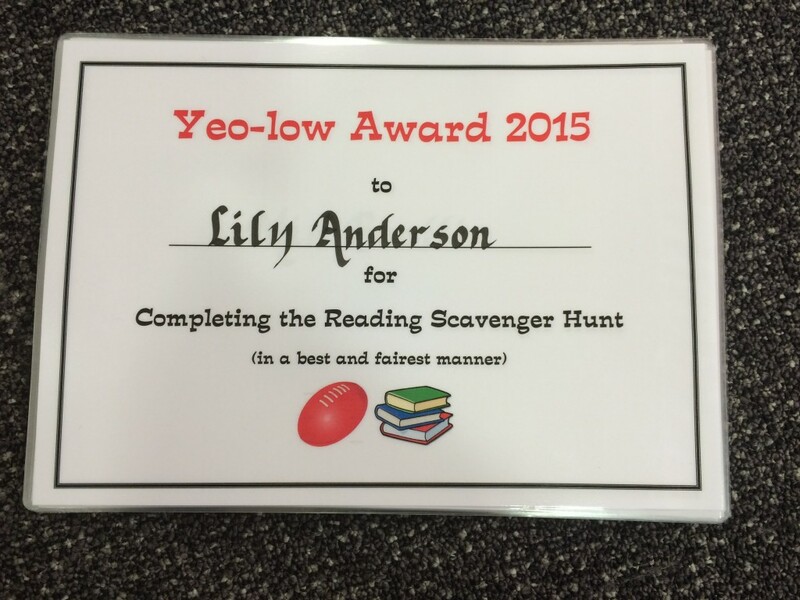 You should be very proud of your big reading effort for the Yeo-low Medal during Term 3. You are a very worthy winner! It was wonderful to have Adrian there to congratulate our Yeo-low Medal winners. We have been so lucky to have his support and encouragement.